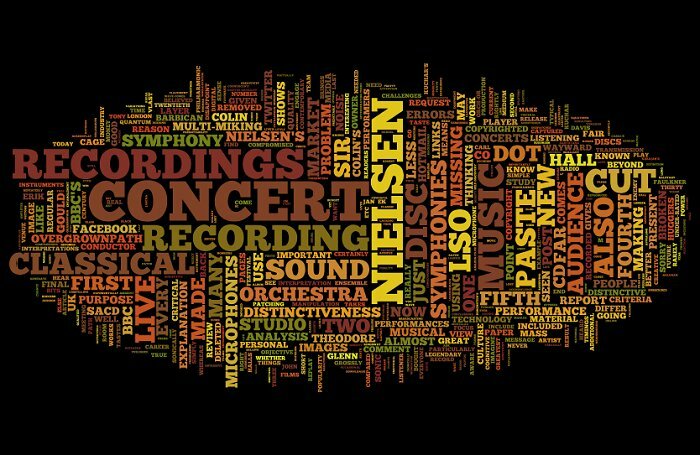 My frustration with the artwork on the LSO Live CD of Nielsen symphonies set me playing with Wordle. This is a toy for generating “word clouds” from text with the size of the word reflecting the number of times it appears, i.e. number of repeats, in the article. The example above is created from my post about the LSO Live disc. More on BBC Radio 3's Classical Collection here and more repeats, but of a very different kind, here. With thanks to Antoine Leboyer for the Wordle heads up. Report broken links, missing images and errors to - overgrownpath at hotmail dot co dot uk Also on Facebook and Twitter.